I began my blogging journey in April this year and I ask myself ‘Why didn’t I start it sooner?” I don’t really know the answer but I have found blogging to be extremely therapeutic. Plus, I have been able to discover more blogs that I love and form friendships with other bloggers, even though we have never met. I am so honoured and excited to announce that my blog, CraftyOrganisedMe has earned its very first award the Newbie Blogging Liebster Award. Thanks to Facebook I discovered a great bloggers group that I joined. One day a fellow blogger shared that she had also been nominated for a blogger award and she was looking for other bloggers to nominate. I suggested myself, (as you do!) I didn’t think I would get chosen…… then one day I received a lovely message telling me I had, so thank you to Iyanna @Yannivlovely. Her blog features articles based on lifestyle, personal finance and everything creative, check it out! 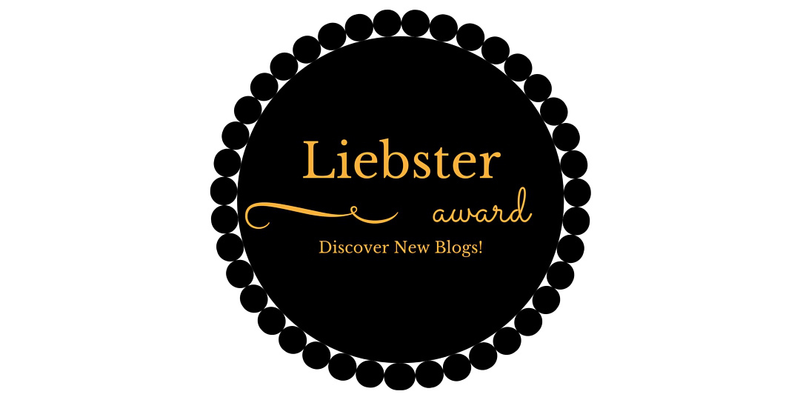 The Newbie Blogging Liebster Award is an award given to new bloggers, usually for those who have less than 200 followers, by other bloggers as a way to support each other in our journey to growing and building our blogs. I have thought about it briefly on/off for years but always quickly dismissed it. Then in April this year I was driving to my in-laws (just under an hours drive from our home), my Son was sleeping and I was listening to a CD. I was thinking about certain things that I would love to share and talk about but didn’t have any way of doing so. I then thought, why not start a blog? At first I dismissed the idea, ‘who would want to read about my life?’ I then thought, ‘who cares, I’m going to do it’. When I arrived at my in-laws I shared with my husband what I had been thinking about and asked what he thought. He didn’t say much, but most of that day I spent time researching which host I would use to start my blog and coming up with a name. One of my favourite bloggers has to be Bec at twodaysgirl. When I started to lose a bit of faith about launching my blog, I sought out help and her blogs Facebook page appeared on my newsfeed. I got in touch and lets say, the rest is history. I love her blog, her humour and her honest tales about her life. I also love Maria at Happy Mum Happy Child, a lovely, honest kiwi Mum. Her Sunday Stalker videos are hilarious. She is another honest Mumma who is very cool. And is also honest about her journey with postnatal depression. Yvette at she.is.sacred a beautiful Mother who is sharing her story with postnatal depression. Thanks to blogging we have found each other, hopefully one day we will meet. I read quite a few blogs I enjoy, I can’t list them all. If there is anyone you know who’s blog I should be reading, let me know. What are your short-term and long term goals for your blog? I think I will continue blogging for as long as I enjoy it, which I hope is a long time to come. I find writing extremely therapeutic and I’ve always liked writing. I would of course like to find more followers who I hope would find my blog useful and entertaining. I would like to be considered to do reviews for local or international businesses. I actually don’t want anything in return, I would just like the opportunity to help promote their business and/or their talent. There are so many individuals out there and to help them spread the word about themselves and what they do, would be an honour. Ha I would love to be able to wake when I want! But doesn’t everyone. I guess I just like being able to wake, not to rush, have a cup of tea, shower and eat my breakfast in peace. This doesn’t happen very often as all, but as long as I get my morning cuppa I’m generally happy. How do you incorporate blogging in your schedule? I don’t have a schedule as such, but the majority of my blogging would be done when I have a little time to myself and one or both of my kids are napping. I find I will get inspired or think of something I want to write about at various times of the day, so I will often jot down a few notes in my notebook. This is a tough question for me, I would love to say New York (but I haven’t been there yet! ), I have been to Paris but I was there for long enough to judge it as a city. I was desperate to leave my hometown Bournemouth in England when I was growing up but now I am not there, I have a lot of love for the place. It always brings a smile to my face when people tell me they have been or are going to Bournemouth. Melbourne is fab! If I had to move to there I would be more than happy. I would love to visit there again one day, maybe I could meet my Australian blogger friends there one day?! What’s the easiest and hardest part about blogging for you? The easiest part of blogging would be the writing, I find the words will often pour out as I type. Ideas for posts come quite freely to me as well. The hardest part would be the time, I wish I had more time to write. But I think I will forever wish for more time to do everything. I’m not very tech savvy, so I have trouble from time to time uploading or moving things around on the blog as I would like it. What is your favourite leisure activity to do? 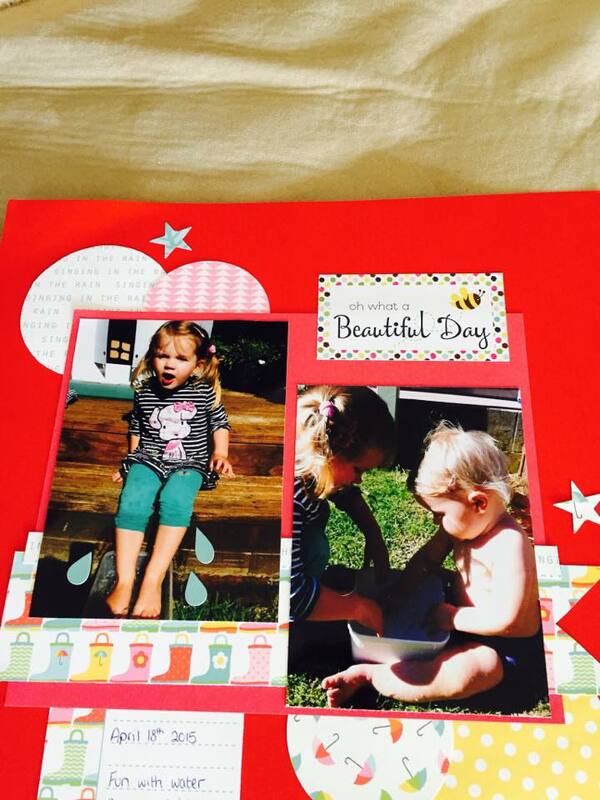 I love to scrapbook. It takes up quite a bit of time though. I always plan to do some at home but I prefer visiting Craft Haven, my favourite craft shop. It is definitely like my second home, I could go there everyday and I would always find something crafty to do. I think being a Mother to my two children and my angel baby will always be my motivation to write. I am always thinking of more ways I can remember my dear Alex and honour his memory. Being a Mum after losing a baby is something I think of ALOT and I’m thinking of and wanting ways to incorporate his memory into their lives. Having depression is something I am not afraid to share and I would be honoured to feel my stories help someone else who us really struggling. Relationship status? Any kids (2 or 4 legged)? I’m happily married, five years in November. I can’t believe how quickly the time has gone. We had Alex in 2011 who was stillborn during pregnancy and Little Miss who is three and Mr Happy who is almost 17 months. I would love a dog but we are busy enough at the moment, we plan to get a family dog one day though. How did you come up with your blogs name? What are your two favourite blog posts you have written? Suggest five other blogs I should follow. Where do you live in the world and who do you live with? What do you enjoy to do when you get some time to yourself? What do you think is the best thing you have discovered through blogging? Do you have a job, outside of blogging. If so what do you do? I look forward to reading your responses and happy blogging! Last week I was lucky enough to have a day to myself. 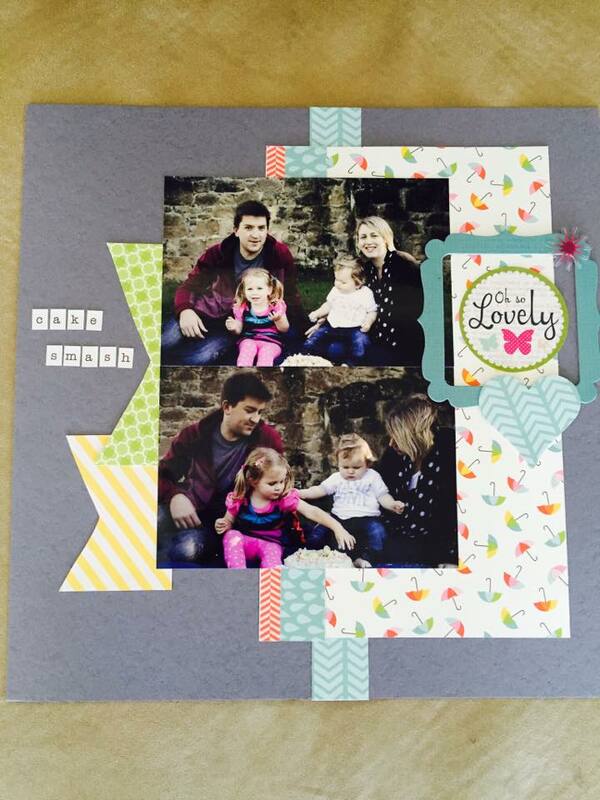 I knew just what I wanted to do, scrapbook! This is definitely one of the things I really enjoy, it helps me to relax and I find it really therapeutic and a good use of my ‘me’ time. I’m sure we can all agree time to yourself can be hard to come by, whether you are busy with work, looking after your kid/s or you just need some time out to refocus. I know at times I’m not very good at making time for myself, so I’m trying to make an effort to arrange a day every now and again. I’m happier when I feel I have had time to myself to do something I enjoy. This usually means kids and husband are happier, since they don’t have a grumpy Mum/wife who is becoming overwhelmed with everyday tasks and the crazy nonsense in her head. (Yes this is me!). I named my blog Craftyorganisedme, so its about time I shared some of crafty stuff. There is a fab shop in New Plymouth called Craft Haven which I like to visit on a regular basis for my craft supplies. (Plus if I cant get into the shop they have a website!). When I am there I am able to spend many hours using their craft equipment with minimal distractions, bliss! Deb and Bronwyn are the owners of this great store and I always feel more like friend than a customer when I am there. I’m pretty pleased with what I accomplished last week. 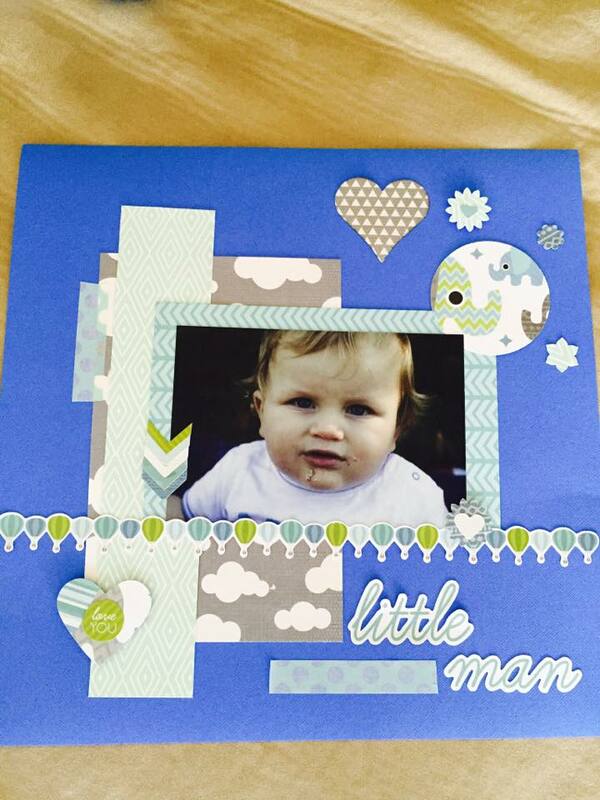 These are 12×12 layouts and I found the inspiration for them on Pinterest, I find most of the my craft ideas on there. I don’t really get to show anyone what I do when I’m at the craft shop. I often ask myself “is anybody actually interested? I guess this was one of the reasons why I thought I would start blogging. I feel I can share some of the things I create and who knows whoever is reading this might actually like seeing what I achieve when I am having some much needed time to myself. Who doesn’t love to colour? I used to love to colour when I was a kid, a new colouring book and some felt tips were always a great present and I know my 3 year old Little Miss enjoys colouring. She was lucky enough to aquire some new books and pens for her recent birthday. Even now I’m an adult I enjoy sitting with Little Miss and doing some colouring with her. I always find it a good chance to connect with her at her level and have a catch up, as well as teach her colours and shapes. Recently I have seen quite a bit of information about adult colouring books on social media and I also found a couple of articles which I found of interest. There is evidence that colouring can alleviate stress in adults and also depression. Having depression myself I found it interesting and intriguing. “Colouring can calm the mind and occupies the hands, giving the individual something to do as well as alleviating any negative thoughts”. I also thought it was fascinating that individuals who enjoy creative activities are able to deal with stress better. I love to craft, but of course being Mum to two little ones, working part-time and home-life responsibilities, I don’t always have the opportunity to escape and indulge in craft time. 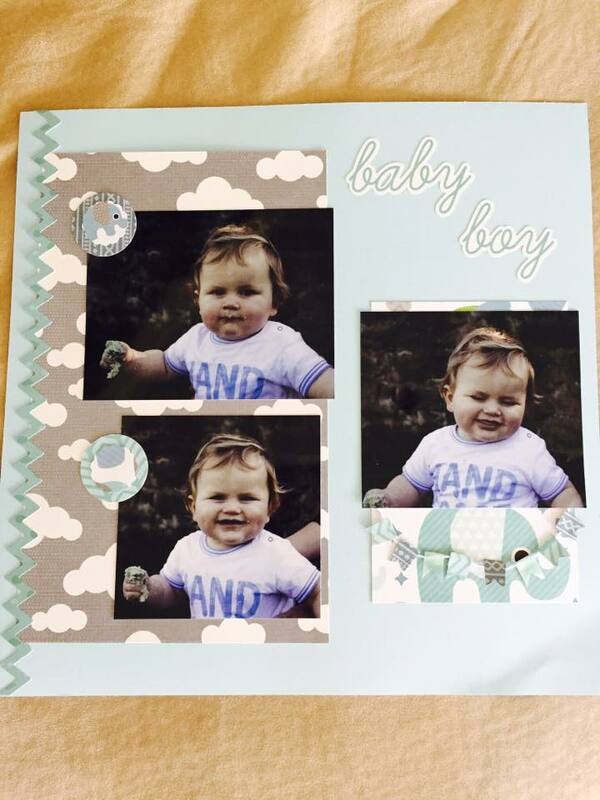 My scrapbooking is something I can really enjoy when I have time to myself. 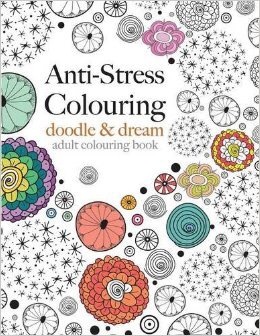 I have actually ordered myself a colouring book, Anti-Stress Colouring: doodle & dream by Christina Rose. I’m looking to doing some of my own colouring, I looked at the sample pages online and they look great. I hope the colouring is something I can do whilst I’m at home, for me and maybe at times alongside Little Miss when she feels like colouring. 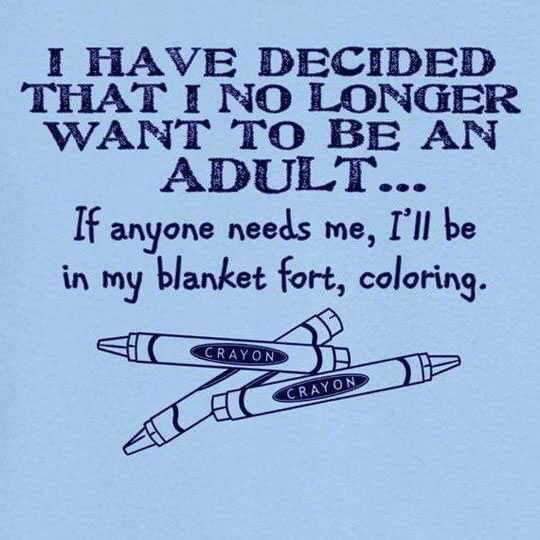 When I searched for adult colouring books, a great article by the New Zealand Herald came up from April 2015. Adult colouring books are currently the top selling books on Amazon and in the UK 5 different adult colouring books are In the top 10 books. 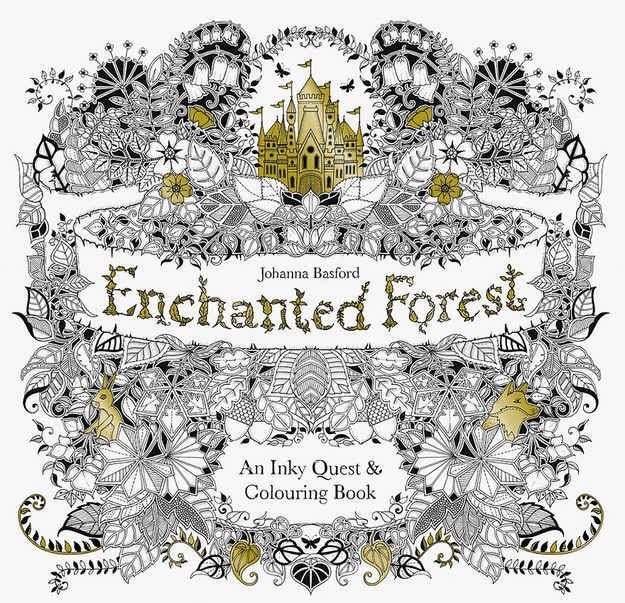 Johanna Basford’s adult colouring books, Secret Garden and Enchanted Forest are hugely popular and are good at easing stress and ‘calming one’s inner child’. A quote from the NZ Herald I thought was engaging is “colouring is all about regaining mindfulness and getting a digital detox”. I’m aware that Mindfulness is a therapy used in the treatment of depression, but I’ll save the discussion about that for a blog post another time. Whilst looking for photos for this blog post, (usually I find everything on Pinterest, another love of mine)! I searched adult colouring books and loads of pins of black/white pages appeared. All printable, ready to be coloured in. 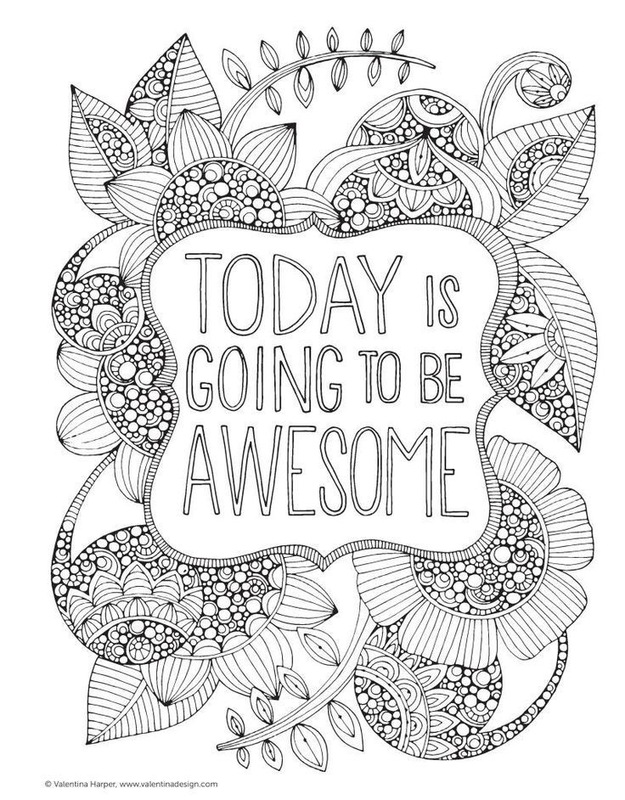 There were also some great quotable colouring pages, which would be ideal for adults or kids to colour and could be used to decorate bedrooms, playrooms or for my teacher friends, classrooms. Love this one, this was one of the many downloadable prints I found on Pinterest. Are any of you keen to get yourself a colouring book?